How Much Can the 2019 Toyota Highlander Tow? Toyota Highlander » How Much Can the 2019 Toyota Highlander Tow? Are you in the market for a new SUV or crossover? Has the new 2019 Toyota Highlander crossed your eye but you want to know more? We’ve got the scoop on everything you need to know about the large crossover like it’s capability! But how much can the 2019 Toyota Highlander tow? As SUVs and crossovers have become more and more popular, drivers are using them in new and different ways than before. Now, many drivers use SUVs and crossovers much like they would a pickup truck, using it to tow and haul heavy cargo for work and recreation. But not every SUV can handle towing a large load. What about the 2019 Toyota Highlander? Don’t worry, the 2019 Toyota Highlander is built to be able to tow and haul with the best of them. 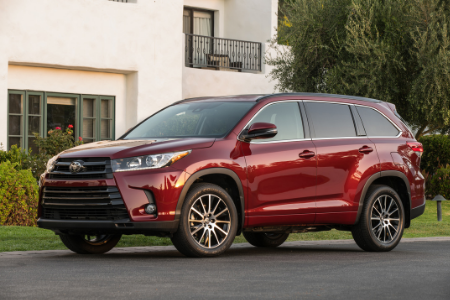 The 2019 Toyota Highlander comes standard with a towing capacity of up to 1,500 pounds. Not bad for those who don’t tow often. But for those who have heavier cargo, the 2019 Toyota Highlander can be equipped to tow up to 5,000 pounds! There’s not much you can’t tow with the 2019 Toyota Highlander! Does the 2019 Toyota Highlander Have a Rearview Back Up Camera? Of course, the 2019 Toyota Highlander is more than just a big and powerful crossover. It also has some of the latest technology and safety features to make driving easier. One feature that driver’s love is a rearview backup camera. Does the 2019 Toyota Highlander have one? Yes! Not only does the 2019 Toyota Highlander have a backup camera, but it’s a Bird’s Eye View Camera! That’s right, the available Bird’s Eye View Camera helps drivers navigate tight spaces better than ever before by giving a live, 360-degree view of the 2019 Toyota Highlander from above, so drivers see everything around them! Want to learn more about the 2019 Toyota Highlander? Contact our staff at Hesser Toyota for more information or to schedule a test drive today! How Big is the 2019 Toyota Highlander’s Cargo Space? This entry was posted on Wednesday, January 16th, 2019 at 2:35 pm	and is filed under Toyota Highlander. You can follow any responses to this entry through the RSS 2.0 feed. You can skip to the end and leave a response. Pinging is currently not allowed.